But unlike the movies, which often depict diffuse saturation and numerous locations simultaneously affected, a true outbreak wouldn’t work like that. It would take hours, days, months and even years to spread into every underpopulated nook and cranny of the United States. Indeed, watching the virus seep across the United States is like watching a flame seek out its next source of oxygen. The spots with heavy populations are gobbled up at a dizzying rate, but the virus slows in underpopulated regions, leaving them more or less protected. If the disease were to begin in the heart of New York City, other big cities such as Boston and Washington, D.C., would be gone within days, if not hours. But in more isolated places, like the northern reaches of Vermont and New Hampshire, there wouldn’t be a zombie in sight. The conclusion that urban areas will be more vulnerable, and more fully saturated with undead, makes a great deal of intuitive sense. Furthermore, it’s a major contributing factor to the economic collapse that typically accompanies a zombie apocalypse. 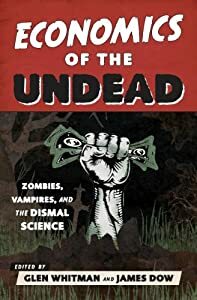 As discussed in various chapters of Economics of the Undead (especially chapters 3, 4, and 5), the prosperity of the modern global economy depends crucially on a vast interconnected web of specialization and trade. Cities provide the hubs, or most significant nodes, within that web. Take out the hubs, and the web will start to disintegrate. And that is why I have to quibble with Alemi’s statement that in less populated areas “everything would remain unchanged.” Ithaca’s well-being depends on New York City, Boston, and many other centers of specialization and trade. If the big cities fell to the zombies, the rest of the country (and world) would almost immediately begin to suffer, even before the arrival of the undead horde. This entry was posted on Friday, June 5th, 2015 at 1:55 pm	and posted in Uncategorized. You can follow any responses to this entry through the RSS 2.0 feed. « Are You Insured Against a Zombie Invasion?